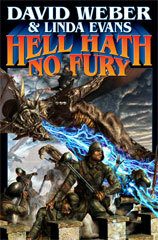 Hell's Gate gathers up the elements of at least four major sub-genres of science fiction and fantasy, twists them diabolically, then disintegrates the borders between them. The result is a story that blends high wizardry, fire-breathing dragons (and their riders), telepathy and other psionics, turn-of-the-20th-century Newtonian physics, military science fiction and military fantasy, parallel universes with portals between them, and far-ranging adventure. It does so in a wildly plausible mishmash that was both demanding and delightful to write. When two men from profoundly different human civilizations inhabiting different parallel universes unexpectedly meet in a primeval forest, two shots are fired, both men are hit, and both sides are abruptly faced with a war that threatens to spread through dozens of inhabited universes. The stakes are drastic, the confrontation is quickly out of control, and the characters are caught in a struggle to remain honorable and civilized in the face of unimaginable horrors each side can unleash. The struggle just to figure out how the opponent's technology functions leads to all sorts of complications.